Get dressed up in your finest skeleton attire for this gothic fundraiser which helps underwrite our free Day of the Dead cultural programs. Presented by Iron Forge Press & Tortuga Tile Works, roots bands, skeleton burlesque and exquisite costuming will take you into a different world of the Mictlan. Doors open 9pm. Bands begin at 10pm peppered with Fashion and Cirque styled performers until 2am. Makeup Artists, Live Art and Craft Crypt will be open to get deeper in the realm of the dead on the Boneyard Bandstand. A $7-$13 cover gets you in and all the proceeds help cover our free events on November 2nd. 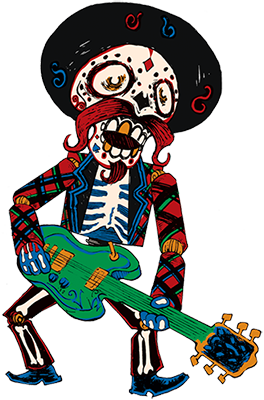 Created by Chuck Loose of Iron Forge Press, the Boneyard Bandstand hosts bands and musical acts that present live music reflective of Mexican traditions, reinterpreted with a modern twist. Live acts perform from 10pm-2am as part of Danse Macabre and include a wide variety of styles from indie pop, rockabilly and American roots music through instrumental, surf and Latin rock.